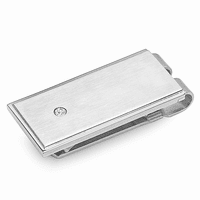 The square face of this polished silver tone money clip is the perfect frame for engraving his initials or name, creating an elegant and cherished personal gift! 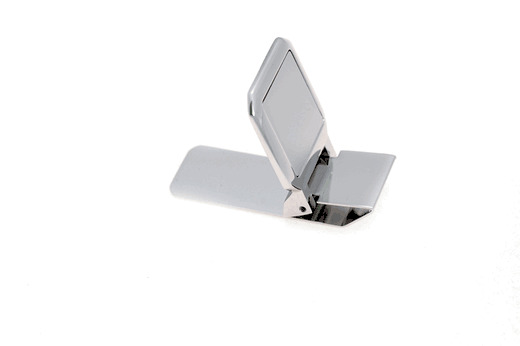 The powerful hinged grip secures up to 20 folded bills, and even a few credit cards. The compact size allows you to carry your cash without a heavy, bulky wallet. 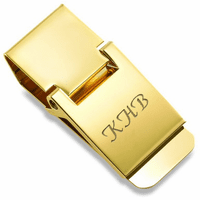 Personalization is free, and we will package your money clip in a jewelry gift box. This is a great gift for groomsmen, graduates, corporate associates and family! Id like to engrave only one letter on it, can I get the font bigger than 60 pts so it can fill the space more? We have updated the maximum font size to 80. If you still need bigger, let us know. Yes, we always center the engraving both top to bottom and left to right. Sorry for this feature not centering it on the preview! Yes, just check the "Personalize" box above the Add to Cart button before adding the item to the shopping cart. There would be no extra charge for the engraving, however, this money clip is out of stock right now. Its going to be a month or two before we get more in stock, sorry! Looks fantastic but fell apart after only 3 days of use. Disappointing. I had trouble finding "just the right" money clip. Executive Gift Shoppe had the widest selection that I could find, and, at very reasonable prices. The hinged money clip that I purchased is exactly what I was looking for. I'm very happy with it. 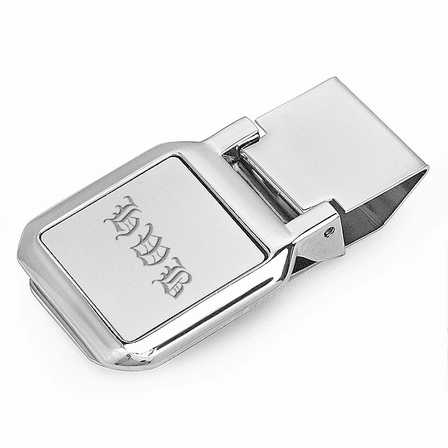 Very nice money clip. Appears to be good quality, well made, and will hold more than those small cheap clips. Very nice ,perfect gift for my husband . 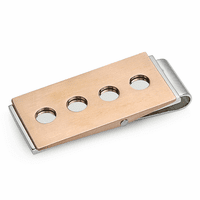 great money clip very well made. Happy with it. The product was very nice, good price, easy to order, arrived quickly, but the engraved plate was not glued in properly. It fell out as soon as I opened the box. It was a gift so I'm glad I opened it first before it was gift wrapped. Otherwise I would have given you five stars. Merchant Response:We're so sorry about the engraving plate! That should obviously not happen. If you'd like, we'd be happy to ship a replacement out free of charge. Just let us know if you'd like us to do that. I have carried my money in a clip for many years now and this one is one of the better types I've used. The delivery was great. I ordered late and yet the order was shipped that day and delivered about three days later just in time for Christmas. I bought three and gave two away for Christmas everyone seemed very pleased. Good product. It's a replacement for another money clip. Fast delivery. I had lost a similar Money Clip years ago, and I finally decided to replace it. I was grateful that Executive Gift Shoppe had this item available. And with engraving also! Was pleased with the timely arrival. Were all given as gifts. I have purchased this item before, in the past. I like it because it holds a fair amount of credit cards and bills. It came in the correct amount of time and looks good, especially for the price. I had asked a question of the seller about the initials - wanted to be sure they would be properly centered, as it doesn't display that too well on-line. Seller responded quickly and assured me it would be centered. I picked Script 2 Line font in the largest size, 60, which in reality is 1/4" hight on a 1" square plate and looks fine. I purchased this piece for my boyfriend for Christmas. I was extremely happy with the finished product when I received it and he was even more happy he opened it Christmas morning. Thank you for the fine attention to detail and reasonable prices. Highly recommended company!! Thanks again! I use this clip to hold a couple credit cards and my cash. It has a wide grip and does the job great. came within the expected amount of time and looks great!! Nice quality and quick delivery. Although engraving was a little shallow and hard to read. I filled letters with black ink and polished off excess which really improved contrast. Great product for the price, the engraving was on the brushed metal and a little hard to see unless turned to right light.